There are a ton of products out there, free and premium, that claim to boost your productivity. Some products hitch onto productivity-enhancing methods, like the Pomodoro Technique Cut Through Procrastination With These Pomodoro Technique Apps & Software Cut Through Procrastination With These Pomodoro Technique Apps & Software Procrastination is a malady that pervades students and workers in all corners of the world and it infects amateurs and professionals alike. As a writer, I suffer from procrastination on a daily basis. Some people... Read More . Others aim to help you to organize and remember the tasks that you need to break down. In particular, to-do lists. Now, to be sure, there is an ocean of apps and programs that provide you with to-do lists. Some of you reading this giveaway may wonder if a commercial application is worth paying for when there are hundreds of free alternatives available. Let me tell you, I was in the same camp of thought until I gave Swift To-Do List 7 a run. Swift To-Do List 7 is available in 3 editions: Standard ($44.95), Professional ($89.95), and Ultimate ($149.95). It is compatible with 32-bit and 64-bit versions of Windows XP, Vista, and 7. This week, we’re giving away 25 copies of Swift To-Do List 7 Professional Edition worth a total of $2,250 for absolutely free! Participating in this giveaway is easy. All you have to do is read through the review and the giveaway details will be at the bottom. This is a wonderful opportunity to get your hands on this great piece of software without paying a cent. The problem with most task management software currently available is that it is either too primitive or too complex and cumbersome. That’s where Swift To-Do List 7 comes in. It is very powerful and feature rich, yet simple, clean, light-weight and easy to use at the same time, which is truly revolutionary. This is what Swift To-Do List looks like when you first launch it (except it would be blank without any tasks). If you’re the kind of person who wants a minimalistic to-do list that looks more like a checklist than a task management system, then this will be too much for you. But I really like the interface setup of Swift To-Do List 7. On the left, you’ll have a browsing tree of available folders and tasks. These are created by you to fit your own needs. Everything here is one of two types: a Task List that can hold sub-level tasks within it, and a Memo. In the screenshot, I have a top-level Make Use Of task list which I’m using as a folder. Within it, I’ve created another task list which I used to track my progress on one of the articles I wrote (you can read it here 10 of the World's Most Famous and Best Hackers (and Their Fascinating Stories) 10 of the World's Most Famous and Best Hackers (and Their Fascinating Stories) White-hat hackers versus black-hat hackers. Here are the best and most famous hackers in history and what they're doing today. Read More in case you’re curious). The cool thing is that you can customize the icon next to each Task List. Instead of boring folders and list icons, I could’ve chosen from a few dozen other icons supplied by the program. The hierarchical nature of Swift To-Do List makes organization extremely easy, and the interface fits the structure of the program flawlessly. The layout is simple and intuitive. It all acts exactly as you would expect it to act. Within each Task List, you can add individual Tasks. The sheer amount of options and choices you can set for each Task is rather impressive to me. Most to-do list programs will let you set a start date, a due date, a task type, and a priority level. Swift To-Do List goes a bit further. You can set reminders, whether on a specified date/time or dynamically based on the due date of the task itself. Swift To-Do List can even send you email reminders on a task if you so desire. A task can also have notes attached to it, which is basically an empty notepad where you can type anything you want. This is great for storing task-related notes and directives that you may have forgotten otherwise. As a bonus, the notes editor is a fully-equipped WYSIWYG editor. You can even add attachments to a task. These can be any sort of file on your computer which you may need to use later on in a way related to your task. Very cool and potentially very useful. And lastly, there’s the recurrence feature. The recurrence options are numerous: daily, weekly, monthly, yearly, monthly on a day of the week, yearly on a day of the week, or a set time after the completion of the task. Hotkeys for quickly navigating and maintaining tasks and task lists. Default values for new tasks. Aesthetic changes that alter the fonts and colors of the display. Reminder behavior, such as flashing, window popups, and sounds. Database encryption in case your task lists have sensitive data. Using Swift To-Do List is pretty simple. But if you need a quick rundown of what to do, you can always call up the Quick Start Guide from the Help menu. This guide runs automatically the first time you run Swift To-Do List, and it was a great help in getting my toes wet with this program. The features of Swift To-Do List 7 are just too numerous to review individually. It’s best that you take a look at the complete list of features on their website in order to get a complete picture of what this app is capable of. 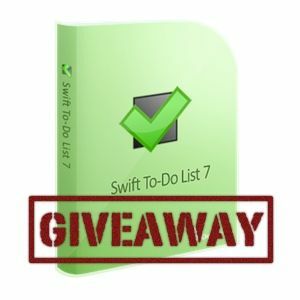 Again, we’re giving away 25 free copies of Swift To-Do List 7 Professional Edition this week. Please be reminded that Swift To-Do List 7 is only available for Windows XP, Vista, or 7 in 32-bit and 64-bit versions. How do I win a copy of Swift To-Do List 7 Professional? Explore more about: MakeUseOf Giveaway, Portable App, To-Do List. Thanks for selecting me as a winner :) The software is really good. I've been using Task Coach but this is better many times over. I wouldn't buy it since it's too expensive, but free is great! I've use the trailand liked it, but found it a bit to pricey for my usage. It would be nice if you didn't require people who are concerned about privacy to be basically forced to use Facebook, Twitter, of G+ in order to participate in a giveaway. Don't want to use it, already using EfficientToDoListFree-Port. It is portable and works excellent. Hey, I wish I could help. Like I said in the article, I'm not a big user of to-do lists and organization software, so I don't exactly know of many free or open-source alternatives. Swift To-Do List 7 - a good system, used previously. Now use a system of collaboration TeamWox. Try it, it's free, and universal: there are tasks, workflow, CRM, IP-telephony, the service desk. All the features in version 2.0 TeamWox an unlimited number of users for 2 months for free. I am so happy to have found you!! "The Only Task Management App You'll Need" as long as you only use Windows. Really? That's going no where. Without mobile device support this is a non-starter. Who wants to lug around a Windows machine? Swift To-Do List 7 does have mobile companion support. It's a feature that's currently in Beta, but you can activate it and it will work. Looks a great deal like my visual basic 6 program, but much more sophisticated. Mobile device integration is non-negotiable. Maybe when it is out of beta and officially released. Until then, not worth considering. this kind of To-Do-List software is most important for the bloggers like me. because bloggers must arrange daily their task always, and must follow it. I hope to get the chance to check this out! Looks like a great todo app, too bad there's no Mac version.